SPIRIT OF CARIFTA – BAAA’s President Rosamunde Carey (left), Minister of Youth, Sports and Culture Hon. 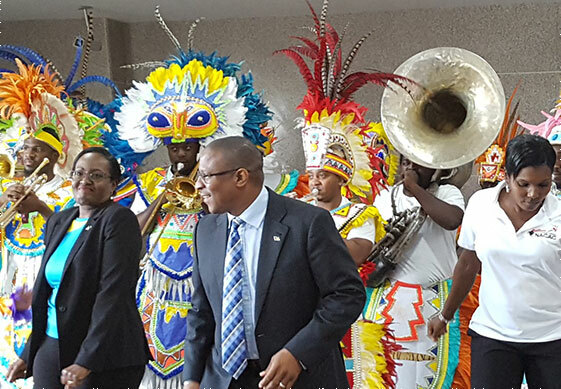 Michael Pintard (Center) and Pauline Davis-Thompson IAAF Council Member dance to the sounds of the CARIFTA Congoes at the launch of the Flow CARIFTA Games Bahamas 2018 press conference. The 47th annual CARIFTA Games will be held in Nassau, Bahamas over the Easter holiday this year, March 30 to April 2. This will be the eighth time the Bahamas will be hosting the event since 1976, 1978, 1981, 1984, 1992, 2002 and 2013. The 2017 edition was staged in Curacao. Held under the aegis of NACAC, the CARIFTA Games is an annual athletics competition founded by the Caribbean Free Trade Association (CARIFTA). In 1972, Austin Sealy, then president of the Amateur Athletic Association of Barbados, inaugurated the CARIFTA Games to mark the transition from the Caribbean Free Trade Association (CARIFTA) to the Caribbean Community (CARICOM). This year the event will host 26 countries, 500 athletes, 400 volunteers and approximately 150 local and international officials. 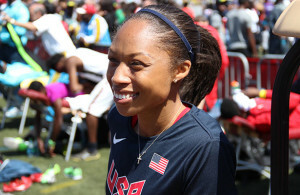 It is the premier track and field junior competition in the region. Many Olympic and World Champions from around the Caribbean competed in the CARIFTA Games including Usain Bolt of Jamaica, Kim Collins of St. Kitts, Ato Bolden of Trinidad and Tobago, Karani James of Grenada, the Golden Girls and Golden Knights sprint and mile relay teams of The Bahamas.